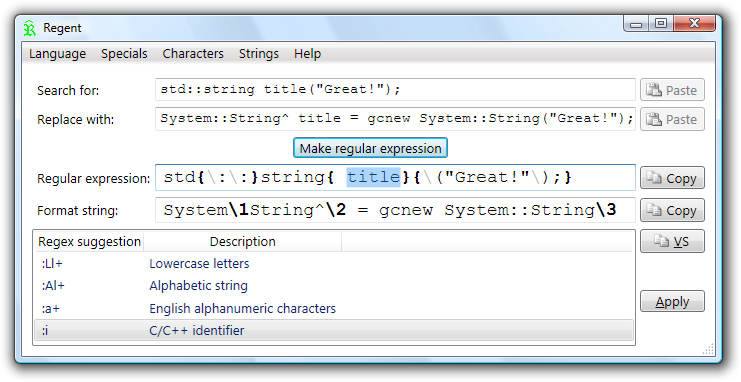 Eliminate routine text modifications with auto generated regular expressions. From a single example Regent creates search and replace regular expression to update all similar text fragments at once. You don't need to remember different regular expressions rules and special characters anymore. Regent supports regular expressions syntax used in the Microsoft Visual Studio Find and Replace dialog (VS 2010, 2008 and 2005 editions), Microsoft Word (XP, 2003 and 2007 editions), Perl compatible regular expressions (UltraEdit, NoteTab Light and EditPad Pro) and standard ECMAScript syntax.